It seemed like a good idea at the time, 5 hours later carrying almost my own body weight in bags, it didn't seem so. I headed off from Sligachan for what I thought would be about an 2:30 hour journey and why not I had only read the day before that you could get there within an hour from Kilmarie. Hence armed with my usual over loaded camera bag, 55l camping bag and to add to it a 100-400mm L lens with a 1.4x converter mated to my 7D permantly in my hand with the hope of seeing some eagles on the way I left in high hopes. The route is absolutely stunning taking you right into the heart of the Isle of Skyes Cullin range and although my body was drained of all life my soul certainly wasn't, the route is sign posted to Loch Coruisk which I was planning on photographing and says it's approx 7.3 miles, you can continue around to Elgol which is a lovely old fishing village which is worth a visit. A bit of perspective was thrown upon on the way when I met an Irish solo hiker who said he had been camping at Elgol the night before and how he was shocked as he could not find a pub. The next day I bumped into him walking to Sligachan a journey which would extend mine on by another 3-4 hours. The thought of no pub and a 9 hour walk made me realise I didn't have it that bad. Upon arriving at Sgurr Na Stri which was the hill I was camping on, a small ledge with a rocky base appeared as the only sane place to camp although it was right on the edge of the cliff, it had a semi level rocky outcrop, which hopefully meant I wouldn't be blown of the edge in my tent in dramatic fashion anyway!! The view was stunning and the tent actually just fit apart from sharing the tent with a large boulderious part of the rocky mountain things weren't bad, that was until I met my new friend or should I say couple of thousand friends. The Scottish midge is quite renowned as being rather friendly and hungry as well and a lot of the evening was spent fending them off with a variety of waving, clapping and midge spray, which all worked to varrying effiecencies. Overall the 10 hour hike there and back, lack of sleep, many bites from mosquitos and midges, aches and pains and constant rain the next day were all worth it. The views were stunning and it's not something many people would get to do, Loch Coruisk is said to be one of the best views in the UK and camping alongside it in the heart of the Cullin range with there unique pointy rocks was an experience I will never forget. Difficulty: 4-6 hour from sligachan, 1-2 hour from Kilmarie (harder route) or boat ride from Elgol to Loch Coruisk. All helps if you are a bit mad. 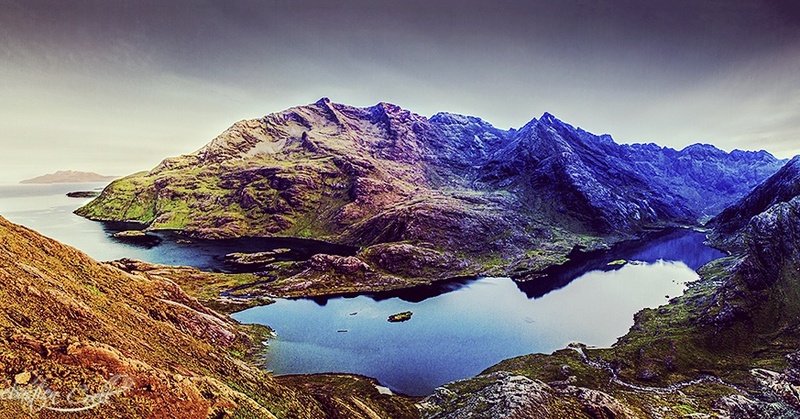 Location: Sgurr Na Stri lies on the Isle of Skyes Cullin range. It would be best to visit on a calm day as it can get quite windy due to its exposed location. Have fun and enjoy.